Former US Secretary of State John Kerry and US President Donald Trump. SWITZERLAND: Former US Secretary of State John Kerry said Tuesday he was not ruling out another tilt at the White House in 2020 but that in the here and now, Donald Trump should quit. “I’ve told people I have not taken it off the table, but I’m not sitting around actively planning a (2020) campaign, or doing something, no,” Kerry, 75, told CNBC television at the World Economic Forum in Davos. Kerry was the Democrats’ defeated candidate in 2004 and if he did pursue a long-shot bid again, he would join a growing field from his party. On current affairs, Kerry said the government shutdown in Washington -- triggered by President Trump’s demands for a border wall -- was “utterly disgraceful” and “embarrassing for our country”. Trump was guilty of “lies”, not least over the Paris climate accord, Kerry added during a discussion with UN oceans envoy Peter Thomson and Rebecca Shaw, chief scientist for environmental group WWF. 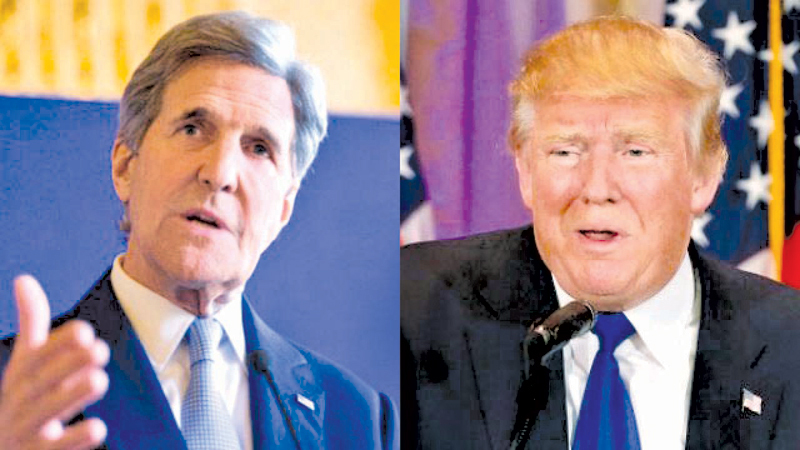 When asked Tuesday what he would say to us President Donald Trump if he were seated across from him, former U.S. Secretary of State John F. Kerry hemmed and hawed a bit. “He doesn’t take any of this seriously,” Kerry said on the panel, adding that he doesn’t think Trump has the “ability” to have deep conversations. Kerry made his comment on a CNBC panel on the future of the oceans. Kerry and former Vice President Al Gore are spending this week urging business and government leaders to address climate change. In addition to calling for Trump’s resignation, Kerry said the president’s decision to withdraw the United States from the Paris climate accord would cost lives. “People will die because of the President’s decision,” Kerry said.